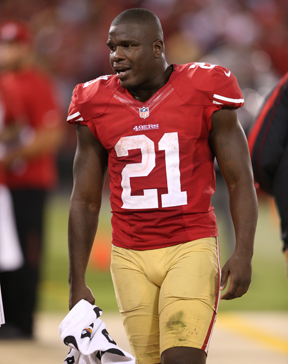 Frank Gore looks at his three 100-yard rushing performances, four touchdowns and overall stellar output in the season’s first half and is quick to praise an un­heralded offensive line that plays such an integral part in helping him do it. Helping San Francisco’s en­tire offense shine, too. These big boys block all over the field, every which way — even if it means taking on a speedy, more athletic defensive back. Gore appreciates every athletic block, every hustle play. The three-time Pro Bowl running back insists he has never had such huge holes ahead of him to run, and that is the ultimate compliment to the 49ers’ talented, much-improved O-line. Gore is now gearing up for a strong stretch the rest of the way with the NFC West-leading Niners (6-2), as long as these guys keep doing the dirty work ahead of him to keep things clicking toward another playoff berth. Gore has run for 656 yards on 119 carries, averaging a career-best 5.5 yards - topping his 5.4 average in 2006. While Gore has only played alongside two Pro Bowl linemen during his eight NFL seasons with San Francisco — Larry Allen in 2006 and left tackle Joe Staley last season —recognition hardly means much to this tight-knit unit that truly enjoys going to work together each day during the grind of a 16-game season. Early last year, the line faced criticism for a slow start, then took more heat after quarterback Alex Smith was sacked nine times in a Thanksgiving night loss at Baltimore. Staley, Jonathan Goodwin and Co. have done their best to ignore — and sometimes even call out — the skeptics and move forward by sticking together to stay the course. And the Niners are getting more of a push from opposing defenses within the division this season, as every team has either upgraded or just plain improved on that side of the ball. Rams coach Jeff Fisher realizes what a load his defense faces on Sunday in stopping Gore, slowing down Smith and his large cast of receivers — and doing all that against a physical, do-everything offensive line. “I can’t remember having to prepare for an offense that was so well-coached and so diversified in the run game and so talented, the different types of run concepts,” Fisher said. Smith connected with nine different wideouts in a 24-3 road rout of the Arizona Cardinals on Monday Night Football on Oct. 29, and like Gore the quarterback gives much of the credit to the line. Smith was also sacked four times that night and has been taken down 22 times this season for 128 lost yards — yet the 2005 No. 1 overall pick recently said he takes the blame and would rather be sacked than risk throwing an interception. That’s just part of the job, said left guard Mike Iupati. He and Davis were both first-round draft picks in 2010 and became instant starters. Now, they’re veterans. Whatever makes them work, other teams are taking notice. There’s so much to deal with on San Francisco’s offense.